Stanikzai spent most his childhood in a refugee camp. When Mojeeb Stanikzai looks at the displaced children of South Sudan, he sees himself. 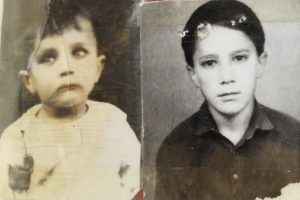 He was just six years old when his father was killed in a bomb blast during the Soviet-Afghan war. Out of money and options, his family fled their native Afghanistan to a refugee camp in Pakistan, traveling through the desert for three days. Stanikzai still remembers the makeshift graves of those killed along the way. Life in the refugee camp was hard, but with help from a relative he was able to get an education and graduate from medical school. Stanikzai gave up a career in medicine for another calling: international development. Now he works with Winrock, helping South Sudan’s children have access to a safe education and a better future. Stanikzai spoke to Haydé Adams FitzPatrick about the lessons he learned from life as a refugee and how he’s paying it forward. 1. How have your experiences growing up in a refugee camp shaped your approach to your work in South Sudan? Stanikzai and his family fled their native Afghanistan when he was seven years old. He returned to the country as a student. I have seen how conflict takes everything from you: your family, your belongings and your dignity. You are forced to start from scratch and become a new person. Refugees, migrants and displaced people need three things: a support structure; access to resources; and a voice – someone who will advocate for them. When we first arrived at the refugee camp, some of our relatives who were already living there rejected us. We had no clue what would happen to us and who to ask for help. Fortunately, years later, my mother’s brother was in a position to help us. He supported my dream to become a doctor. He advocated for us. He gave us a voice. So in my work I always look for ways we can support people in addressing those needs. 2. How do you help people rebuild their lives and restore their hope for the future? I see a community as a microcosm of a nation. If positive change happens in a community, it becomes easier for that change to be replicated in other places. Education is something that gives you hope for the future; with it, you can rebuild your life, like I did. My parents were my first teachers. My mother taught me the basics, and I was able to teach others from a young age. Later, I started earning money from teaching. I was given a future through education. It fed me — literally. I say to people, do what you can to make sure you educate your family — your sons and your daughters. 3. 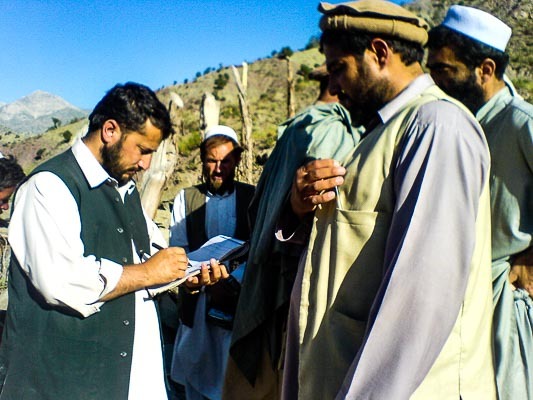 How can a community suffering from recurrent conflict make sure that change is sustainable? When I look at conflicts around the world, most of them are driven by politics. We as a development community cannot fix everything. But we can raise awareness about the effects of conflict and respond to those effects by giving people access to the resources they need to rebuild their lives. Earlier in my career, we tried this in Afghanistan, to go to the root cause of the problem. We managed to bring opposing factions to the table. But, because we couldn’t solve the political root cause, the conflict went into a chronic phase and continues to be a problem. So it’s not easy to remove the root of the problem alone as a development organization. But we can help change mindsets and attitudes, so people choose peace over conflict. 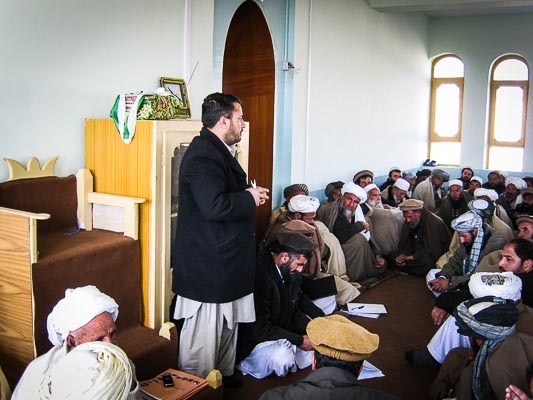 Working to change mindsets: Stanikzai addressing community elders in Logar, Afghanistan. 4. Do you remember a moment in your work that made you optimistic about the future? Whenever I go to South Sudan and visit schools, I see teachers and students using the learning materials that we have provided them. It reminds me of my own childhood, when those who had given us books came to see how we were doing. Now I am at the other end, working to support children in similar situations and helping to bring a positive change in their lives. That gives me great satisfaction. It makes me feel proud, and optimistic about the future. 5. What inspired/motivated you to put your talents and expertise to work at Winrock? At Winrock, people are always looking for new, innovative ways to do development work. We look at the greater outcome of the work we do and how those outcomes or results would ultimately contribute to the future of the country in which we are working. The organization itself has come a long way, starting in agriculture and entrepreneurship and expanding into the areas of counter-trafficking, education, governance and the environment. I’m glad to be part of this family. 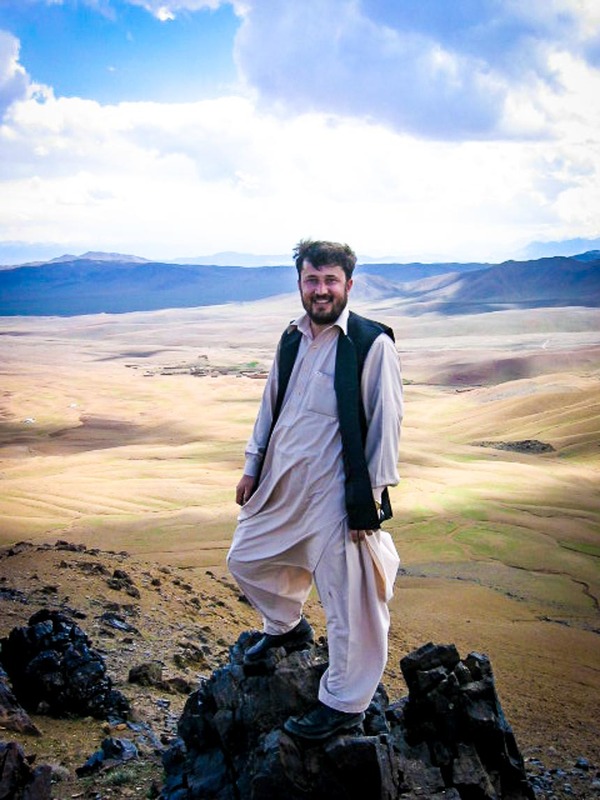 Mojeeb Stanikzai is a senior program officer with Winrock’s Civil Society and Education Group. He manages the USAID-funded Room to Learn project in South Sudan.